Connect with your customers using Mauritius Telecom’s telephony network. The fixed line gives you access to affordable local and international calls, broadband internet packages, TV channels and so much more. You will be contacted to fix an appointment for installation at your location. Installation of your fixed line is within 4 weeks if you are within our network coverage. Installation fee mentioned above is during office hours. An additional fee of Rs 500 will be charged for installation outside office hours. Installation fee of your new line will appear on your first fixed line bill. Once your line is installed, you will need to proceed to nearest Telecom Shop to pay the security deposit (within 4 weeks of line installation). Note: When you reside in a remote location, outside our network coverage, we will not be able to proceed with your application immediately. Our team will perform a feasibility study of your area and once the appropriate infrastructure is ready, we will contact you. 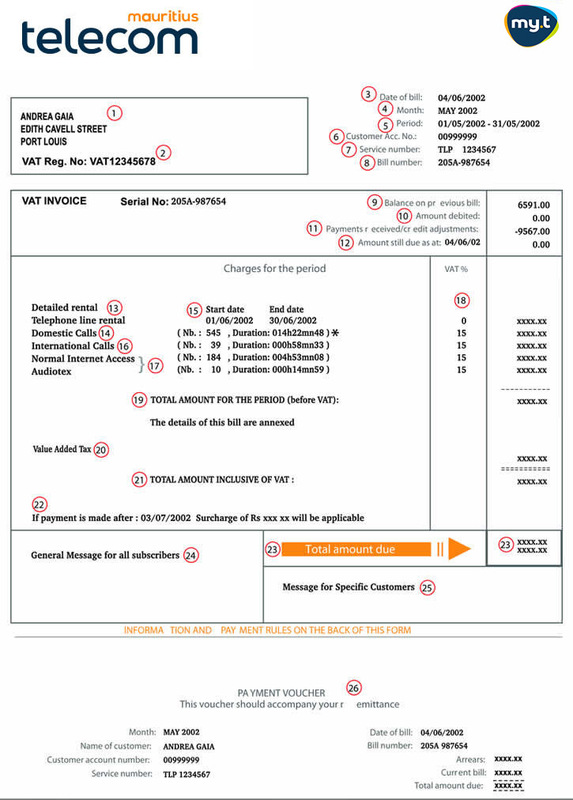 "If payment is...": This indicates that if bill is not settled by the specified date, the applicable surcharge will be claimed. With Follow Me, transfer all your calls to a mobile or fixed number. Allows you to access your call details. * Calls exclude special numbers (150, 152, 303xxxx, 302xxxx, 301xxxx etc).All tariffs are VAT exclusive. Call your international contacts directly from your fixed line and pay for the calls on your MT telephone bill. To make an international call, dial 020 , followed by the country code, area code and the number of the person you want to call. All tariffs are VAT exclusive. To make an international call via Sezam, dial 3202051 , followed by the country code, area code and the number of the person you want to call. All tariffs are VAT exclusive. 020 tariffs apply for countries not listed in the table. Note: International calls are by default barred on new lines. You can request for this service once you come to pay for your security deposit. Access to international calls from your fixed line is free of charge. If you want to choose your fixed line no, you can subscribe to our Golden Number service. When you are submitting your application for a new line, tell us the number you want. If the number is available, we’ll allocate the number to you. You will be charged Rs800 for a Golden Number. You can request for a Golden Number at any time, even after your line has been installed. Call Waiting lets you handle two calls at a time just like on your mobile phone. How do I subscribe to Call Waiting? How do I activate Call Waiting? -	Your phone will bleep to tell you that a second call is on the line. You can either put the first caller on hold and speak to the second caller, or end your first call and speak to the second caller. 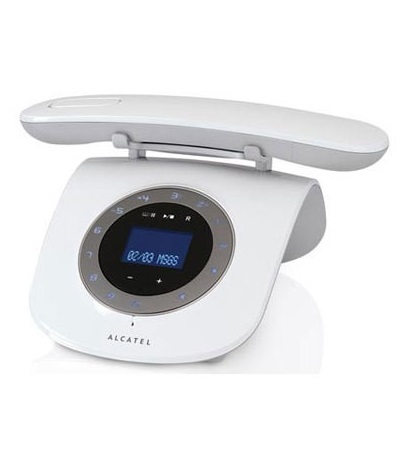 -	You may also set up a 3-way conference call (free of charge) to be able to talk with your 2 contacts at the same time. Except for CLIR which is charged at Rs 50/month and CLI which is charged at Rs 20/month, the first value added service you subscribe to costs Rs 20/month. For each additional service you pay Rs 10/month. All prices are VAT exclusive. To get started, you will need a telephone that supports CLI. 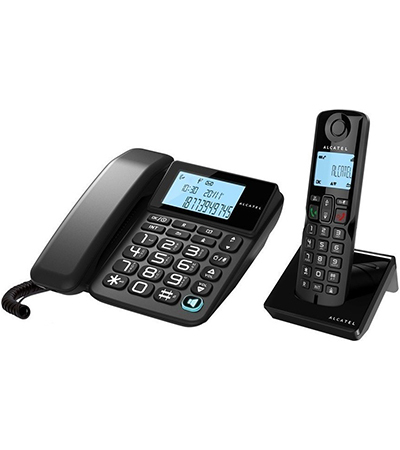 We offer a wide range of CLI phones and terminals. 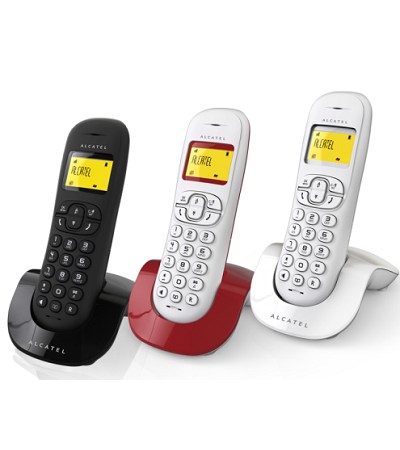 Check out our range of telephone sets with Caller ID Display feature or visit our shops. How do I subscribe to CLI? Phone Lock lets you restrict usage and access to your fixed phone. How do I subscribe to Phone Lock? Go to the nearest Telecom Shop. We’ll register your request and provide you with a 4-digit PIN. The service will be activated within 24 hours on your line. How do I use Phone Lock? To activate phone lock: Dial *33*. Enter your password. Dial #. Your phone has been locked. Note: If your voice service is on fibre, to activate phone lock for local and international calls: Dial *33*. Enter your password. Dial *01#. If you wish to restrict international calls only: Dial *33*. Enter your password. Dial *03#. To deactivate phone lock: Dial #33*. Enter your password. Dial #. Your phone has been unlocked. If your voice service is on fibre, your default password is 1000. To change the password, lift your handset. Dial *03*. Enter your current password. Press *. Enter your new password. Press *. Enter your new password again. Press #. 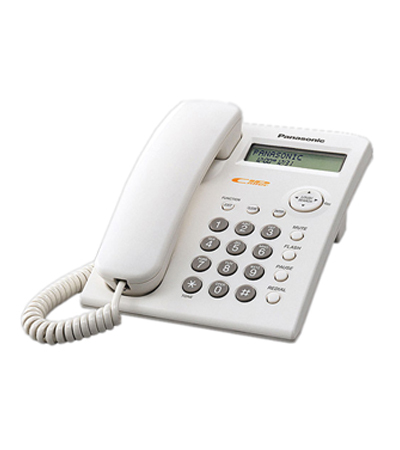 You are expecting an important phone call on your fixed line and cannot stay by the phone? With Follow Me, transfer all your calls to a mobile or fixed number. How do I subscribe to Follow Me? How do I use Follow Me? Except for CLIR which is charged at Rs 50/month and CLI which is charged at Rs 20/month, the first value added service you subscribe to costs Rs 20/month. For each additional service you pay Rs 10/month. All prices are VAT exclusive. 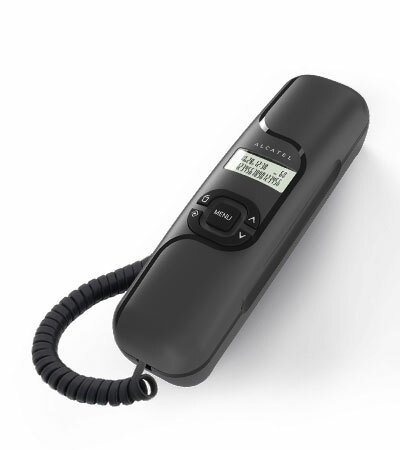 When you are away from home or you are not available to answer your calls, the caller can leave you voice messages. You can check for those Voice Mail messages once you are back home or even from another phone line. Voice Mail lets you filter and return missed calls, when you are free to do so. 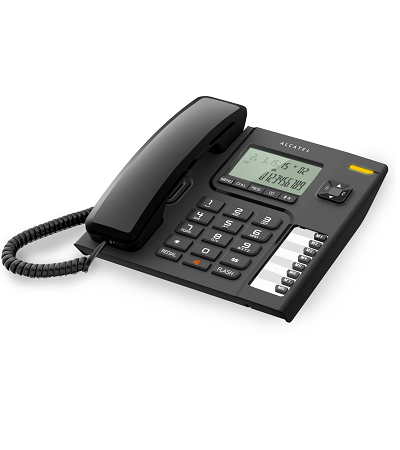 Voice Mail* and 3-Way Conference are both included for free when you have an MT fixed line. 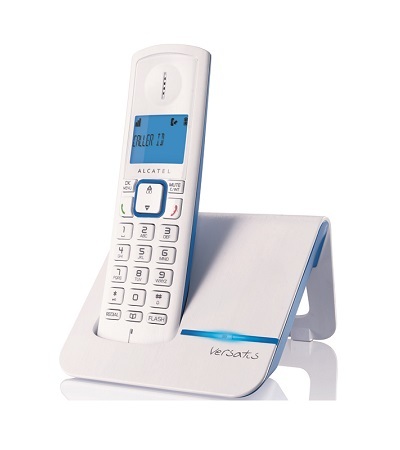 How to use Voice Mail? How to activate voicemail on my line? 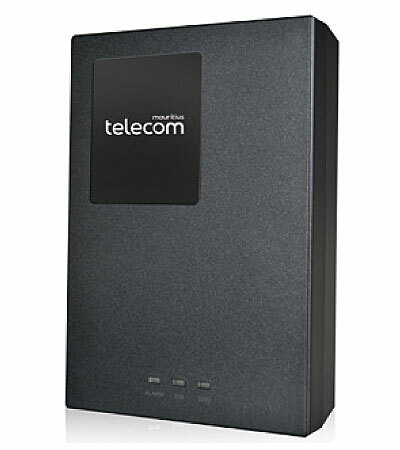 Go to the nearest Telecom Shop. With Caller Line Identification Restriction, you can keep your number private. Once you have subscribed to the service your number will not be displayed when calling a person or a company who has caller line identification *. How do I subscribe to CLIR? Your fixed line also gives you access to broadband internet packages. Check out our Business Boost packages. Ever wished someone else could join in to your conversation with your caller? Well you can, with 3-way conference. 3-way conference allows you to speak to 2 persons at the same time. And what's even more this is included for free when you have an MT fixed line. How do I start a 3-way conversation? Press ‘R’ or ‘Flash’ on your telephone pad, then dial the number of your 2nd contact (your 1st contact is automatically put on hold). Your 2nd contact answers and you can talk together. To establish a 3-way conference, press ‘R’ or ‘Flash’, then 3 on your telephone pad. The outgoing call charges are borne by the person who initiates the 3-way Conference. For bills within one year: Rs 50 per bill. Note: Itemised bills for the past one year can be viewed free of charge on my.t selfcare. Call barring allows you to block incoming, outgoing and international calls. What type of calls may I block? How to subscribe to call barring? A once-off fee of Rs 100 (VAT exc.). Blocking of international calls is free of charge. What if I no longer want to bar my calls? What if I no longer want to bar my calls? In case you no longer wish to bar outgoing, incoming or international calls, you may request for an unbarring of service on your fixed line. Please go to the nearest Telecom shop. Unbarring services are charged a once-off fee of Rs 100 (VAT exc.). See also Phone Lock which allows you to have a better control of the use of your telephone by having your own PIN code.